The Folded Corners quilt block is sort of an optical illusion, if you stick to colours in the same colour family. By using a slightly lighter shade of the darkest colour in the four corners of the block, it appears that each corner is folded into the centre -- hence the name of the block. This easy quilt block is a standard nine patch utilizing half square triangles and flying geese patches -- both very commonly used patches in quiltmaking. 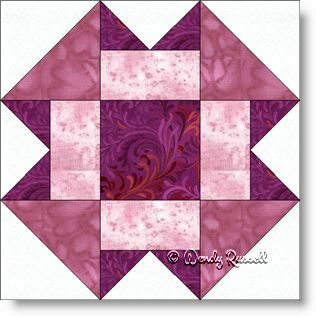 Both sample quilts illustrated use an on point layout with blank blocks included to showcase your quilting skills. Sashing separates the blocks on one of the quilts to feature some additional interest.